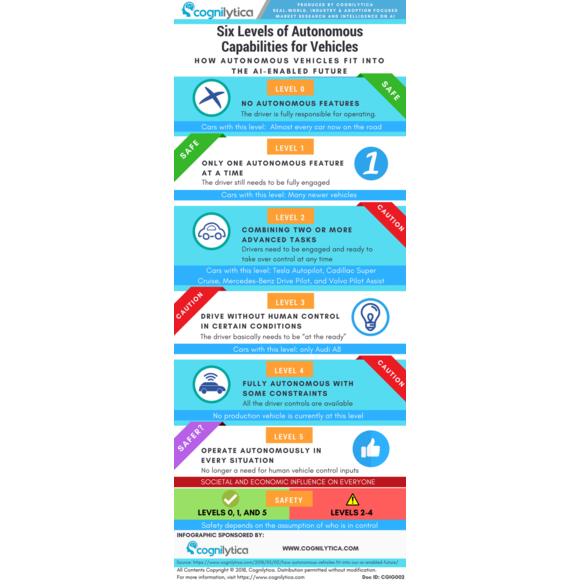 Automotive manufacturers and transportation technology vendors are rapidly progressing us towards fully autonomous vehicles. But not all autonomous vehicles are the same and right now we’re nowhere near full autonomy. The Society for Automotive Engineers has defined six levels of autonomy from Level 0 to Level 5. Check out this infographic to understand all these levels and what the differences are. 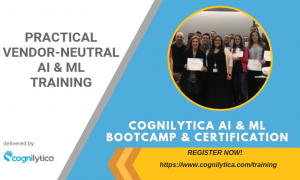 Cognilytica’s infographic explains the six levels of autonomous capabilities including explanations and examples for each level. Are vehicles at each level equally safe? Quite possibly, vehicles at autonomy levels 2-4 could be more dangerous than levels 0, 1, and 5 vehicles because of the uncertain element of human control. Large companies such as Google and Ford announced they will only pursue level 5 vehicles for safety reasons. Level 5 fully autonomous vehicles will bring dramatic changes to most industries and will have more societal and economic impacts that people are thinking. The more we think about the future that’s Level 5 autonomous, the more we realize how much this will result in changes — not just for individual drivers or car companies, but for everyone. Your business and your life will be impacted.